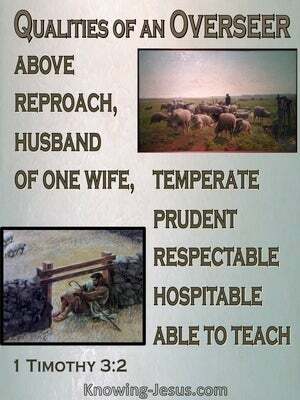 Now the overseer must be above reproach, the husband of [only] one wife, sober-minded [Note: When this word, used here figuratively, is used in its literal sense, it means to abstain from intoxicating drinks], sensible, respectable, hospitable, capable of teaching. 1 It is a trustworthy statement: if any man aspires to the office of overseer, it is a fine work he desires to do. 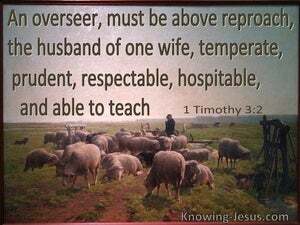 2 An overseer, then, must be above reproach, the husband of one wife, temperate, prudent, respectable, hospitable, able to teach, 3 not addicted to wine or pugnacious, but gentle, peaceable, free from the love of money.